Umayr ibn Sad al-Ansari RA became an orphan at an early age. Umayr ibn Sad al-Ansari RA father died leaving him and his mother poor and destitute. Umayr ibn Sad al-Ansari RA mother eventually married again, to one of the richest men in Madinah. His name was Julas ibn Suwayd who was from the powerful tribe of al-Aws. Umayr was well looked after by Julas and loved him as a son would love a father. Indeed he began to forget that he was an orphan. As Umayr grew older, Julas fondness and love for him grew. Julas would marvel at the intelligence of Umayr ibn Sad al-Ansari RA displayed in everything he did and at the honesty and trustworthiness which characterized his behavior. When he was barely ten years old, Umayr ibn Sad al-Ansari RA became a Muslim. Faith found in his tender heart a secure niche and penetrated deeply into his being. In spite of youthfulness, he would never delay in the performance of solah behind Rasulullah SAW. Often Umayr ibn Sad al-Ansari RA would be found in the first row of worshippers, hoping for the tawaf promised those who attend mosques early and sit in the foremost rows. Umayr ibn Sad al-Ansari RA mother was particularly pleased whenever she saw him going to and coming from the mosque, sometimes with her husband and sometimes alone. Umayr ibn Sad al-Ansari RA days passed in this fashion with no major disturbance to upset his calm and contentment. This idyllic state, however, could not last forever. Umayr ibn Sad al-Ansari RA was soon to face a most difficult test for a boy of his age, a test which shook the peaceful and loving atmosphere of his home and challenged the steadfastness of his faith. In the ninth year after the Hijrah, Rasulullah SAW, announced his intention to lead an expedition to Tabuk against the Byzantine forces. Rasulullah SAW ordered the Muslims to get themselves ready and make the necessary preparations. Usually when Rasulullah SAW wanted to go on a military campaign he would not give precise details of his objective or he would set off in a direction opposite to his intended destination. This was for security purposes and to confound the enemy's intelligence service. This he did not do in announcing the expedition to Tabuk. This was perhaps because of the great distance of Tabuk from Madinah, the enormous difficulties expected and the overwhelming strength of the enemy. The preparations needed for this expedition had to be extensive. In spite of the fact that summer had set in and the intense heat produced languor and listlessness, and in spite of the fact that the date crops needed harvesting, the Muslims responded enthusiastically to the call of Rasulullah SAW and busied themselves in preparing for the arduous campaign ahead. There was however a group of Munafiqeen or hypocrites who outwardly had declared their acceptance of Islam but inwardly did not believe in it. They were critical of the expedition and tried to weaken the resolve of the Muslims. They even ridiculed Rasulullah SAW in their private gatherings. Disbelief and hatred remained in their hearts. One day, shortly before the army was due to set out, the young Umayr ibn Sad al-Ansari RA returned home after performing Salat in the mosque. Umayr ibn Sad al-Ansari RA was all agog with excitement. Umayr ibn Sad al-Ansari RA had just witnessed the great generosity and the spontaneous spirit of sacrifice which the Muslims displayed in preparing for the expedition. Umayr ibn Sad al-Ansari RA had seen women of the Muhajirin and the Ansar donating their jewellery and their ornaments to buy provisions and equipment for the army. Umayr ibn Sad al-Ansari RA had seen Saidina Uthman ibn Affan RA handing over a purse containing a thousand gold dinars to Rasulullah SAW and Abdur Rahman ibn Auf RA carrying on his shoulders two hundred awqiyyah of gold and placing it before Rasulullah SAW. Indeed he had even seen a man trying to sell his bed in order to purchase a sword for himself. At home, Umayr ibn Sad al-Ansari RA recalled these moving and inspiring scenes. Umayr ibn Sad al-Ansari RA was surprised however that Julas was so slow in preparing for the expedition with the Prophet and at his delay in contributing especially since he was quite rich and could afford to give generously. Umayr felt that he had to arouse his ardor or stir his sense of generosity and manliness. So with great enthusiasm Umayr ibn Sad al-Ansari RA related what he had seen and heard at the mosque particularly the case of those believers who, with great fervor, had come to enlist themselves in the army and were turned away by the Prophet because there was not sufficient means of transport. Umayr ibn Sad al-Ansari RA related how sad and disappointed these people were at not realizing their desire to go on the path of Jihad and sacrifice for the sake of Islam. Julas' response was sharp and shocking. "If Muhammad is true in claiming that he is a Prophet ," he shouted angrily, "then we are all worse than donkeys." Umayr ibn Sad al-Ansari RA was flabbergasted. Umayr ibn Sad al-Ansari RA could not believe what he had heard. Umayr ibn Sad al-Ansari RA did not think that a man as intelligent as Julas could have uttered such words, words which put him instantly outside the pale of faith. "By Allah, O Julas, there is no one on the face of the earth, after Muhammad ibn Abdullah, dearer to me than you. You are the closest of men to me and you have been most generous to me. But you have uttered words which, if I should mention them will expose and humiliate you. If I conceal them, however, I will be a traitor to my trust and destroy myself and my religion. I will, therefore, go to Rasulullah SAW and tell him what you have said. It is up to you to clarify your position." The young Umayr ibn Sad al-Ansari RA went to the mosque and told Rasulullah SAW what he had heard from Julas. Rasulullah SAW asked him to stay with him and sent one of his companions to summon Julas. Julas came, greeted the Prophet and sat in front of him. Rasulullah SAW straightaway asked him: "What did you say that Umayr ibn Sad heard?" and he mentioned what Umayr had reported to him. "(The hypocrites) swear by God that they have said (nothing wrong); yet most certainly they have uttered a saying which is a denial of the truth, and have thus denied the truth after having professed their self-surrender to God; for they were aiming at something which was beyond their reach. And they could find no fault (with the Faith) save that God had enriched them and (caused) His Apostle to enrich them out of His bounty. Hence, if they repent, it will be for their own good; but if they turn away, God will cause them to suffer a grievous suffering in this world and in the life to come and they will find no helper on earth, and none to give them succour." (The Quran, Surah at-Tawbah, 9:74). Julas trembled with fear at what he heard and in his anguish, could hardly speak. Finally, he turned to the Prophet and said: "I do repent, O Rasulullah SAW. I do repent. Umayr ibn Sad al-Ansari RA told the truth and I lied. I beseech Allah to accept my repentance..."
Rasulullah SAW turned to the young Umayr ibn Sad al-Ansari RA. Tears of joy moistened his youthful face, radiant with the light of faith. With his noble hand, Rasulullah SAW tenderly took his ear and said: "Young man, your ear has been true in what it heard and your Lord has confirmed the truth of what you said." Julas returned to the fold of Islam and was a good and faithful Muslim thereafter. The companions realized that by his generosity and good treatment of Umayr ibn Sad al-Ansari RA, he had reformed. Whenever Umayr ibn Sad al-Ansari RA was mentioned, Julas would say: "My Allah reward Umayr with goodness on my behalf. Umayr ibn Sad al-Ansari RA certainly saved me from kufr and preserved my neck from the fire of hell." Umayr ibn Sad al-Ansari RA grew up and distinguished him in later years with the same devotion and firmness which he had shown in early life. During the caliphate of Saidina Umar ibn al-Khattab RA, the people of Hims in Syria complained much and bitterly of the governors appointed to the city even though Saidina Umar ibn al-Khattab RA in particular used to pay special attention to the type of men he chose as his provincial governors. In selecting a governor, Saidina Umar ibn al-Khattab RA would say: "I want a man who when he is among the people and is not their Amir, should not behave as their Amir, and when he is among them as an Amir, he should behave as one of them. “I want a governor who will not distinguish himself from the people by the clothes he wears, or the food he eats or the house he lives in. I want a governor who would establish Salat among the people, treat them equitably and with justice and does not close his door when they come to him in need." "O people! 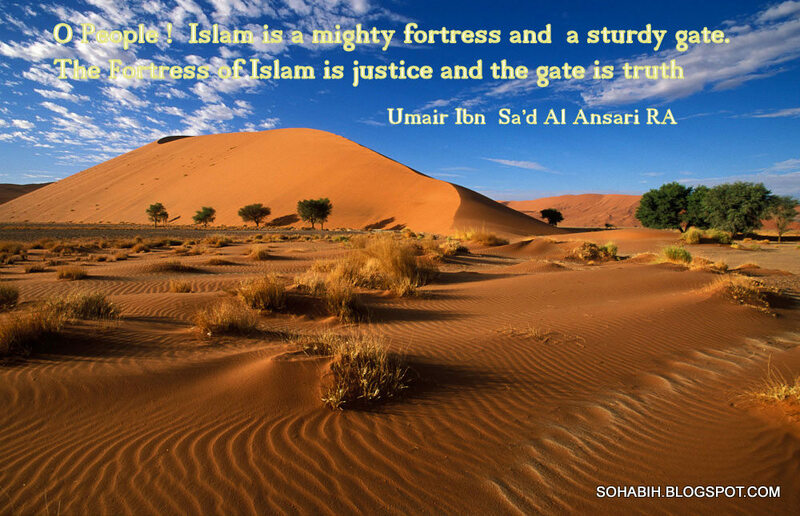 Islam is a mighty fortress and a sturdy gate. 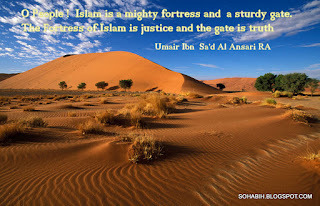 The fortress of Islam is justice and its gate is truth. If you destroy the fortress and demolish the gate you would undermine the defenses of this religion. "Islam will remain strong so long as the Sultan or central authority is strong. The strength of the Sultan neither comes from flogging with the whip, nor killing with the sword but from ruling with justice and holding fast to truth." Umayr ibn Sad al-Ansari RA spent a full year in Hims during which, it is said, he did not write a single letter to the Amir al-Muminin. Nor did he send any taxes to the central treasury in Madinah, neither a dirham nor a dinar. Umar was always concerned about the performance of his governors and was afraid that positions of authority would corrupt them. As far as he was concerned, there was no one who was free from sin and corrupting influences apart from the noble Prophet, peace be upon him. He summoned his secretary and said: "Write to Umayr ibn Sad al-Ansari RA and say to him: "When the letter of the Amir al-Muminin reaches you, leave Hims and come to him and bring with you whatever taxes you have collected from the Muslims." Umayr ibn Sad al-Ansari RA received the letter. He took his food pouch and hung his eating, drinking and washing utensils over his shoulder. Umayr ibn Sad al-Ansari RA took his spear and left Hims and the governorship behind him. Umayr ibn Sad al-Ansari RA set off for Madinah on foot. As Umayr ibn Sad al-Ansari RA approached Madinah, he was badly sunburnt, his body was gaunt and his hair had grown long. His appearance showed all the signs of the long and arduous journey. Umar, on seeing him, was astonished. What's wrong with you, Umayr?" he asked with deep concern. "Nothing is wrong with me, O Amir al-Muminin," replied Umayr ibn Sad al-Ansari RA. "I am fine and healthy, praise be to God, and I carry with me all (my) worldly possessions." "And what worldly possessions have you got?" asked Umar thinking that he was carrying money for the Bayt al-mal or treasury of the Muslims." "I have my pouch in which I put my food provisions. I have this vessel from which I eat and which I use for washing my hair and clothes. And I have this cup for making wudu and drinking..." "Did you come on foot?" asked Umar. "Yes, O Amir al-Muminin." "Weren't you given from your Amir-ship an animal to ride on?" "They did not give me one and I did not ask them." "And where is the amount you brought for the Baitulmal?" "I didn't bring anything." "And why not?" "When I arrived at Hims," said Umayr, "I called the righteous persons of the town to a meeting and gave them the responsibility of collecting the taxes. Whenever they collected any amounts of money I would seek their advice and spent it (all) on those who were deserving among them." "Harith, go to Umayr ibn Sad al-Ansari RA and stay with him as though you were a guest. If you see on him any signs of luxury or good living, return quietly as you went. If, however, you find him in straitened circumstances give him these dinars." Umar handed Harith a bag with a hundred dinars. Al-Harith set out for Umayr's village and found his home after making enquiries. "As-salamu alaykum wa rahmatullah," he greeted Umayr ibn Sad al-Ansari RA. "From aI-Madinah." "How are the Muslims there?" "Fine." "How is the Amir al-Muminin?" "He is fine and doing well." "Has he applied the hudud laws?" "Yes. He carried out the sentence of punishment on his own son for committing the crime of adultery. His son died as a result of the punishment." Al-Harith continued: "O Allah, help Umar. I only know that he has a great love for you." Al-Harith stayed as Umayr's guest for three nights. On each night he was given only a small flat piece of barley bread. On the third day a local man said to Harith: "Umayr and his family are suffering great hardship. They only have these loaves which they have given you in preference to themselves. They are hungry and in great distress. Harith went to Umayr ibn Sad al-Ansari RA and gave him the bag of money. "What is this?" asked Umayr. "The Amir al-Muminin sent it to you." "Return it to him. Give him my greetings of peace and tell him that Umayr has no need of it." "Take it, O Umayr," shouted his wife who was listening to the conversation between her husband and his guest. "If you need it, you can spend it. If not, you can spend it in other appropriate ways, for those in need here are many." When al-Harith heard what she had said, he placed the dinars in front of Umayr ibn Sad al-Ansari RA and left. Umayr ibn Sad al-Ansari RA took the money and placed it in a small bag. He only went to sleep that night after he had distributed the money to those in needs and especially to the children of those who had been martyred. Al-Harith returned to Madinah and was questioned by Saidina Umar ibn al-Khattab RA. "What have you seen, Harith?" "A very distressing situation, O Amir al-Muminin." "Did you give him the dinars?" "Yes, O Amir al-Muminin." "What did he do with them?" "I don't know. But I think that he did not keep a single dirham of it for himself." Saidina Umar ibn al-Khattab RA wrote to Umayr ibn Sad al-Ansari RA: "When you receive this letter, I do not put it down until you come to me." 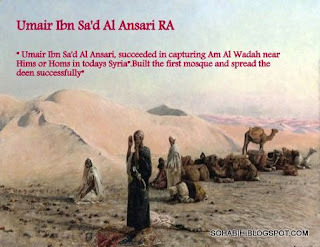 Umayr ibn Sad al-Ansari RA proceeded straightaway to Madinah. "About the food, we do not need it, O Amir al-Muminin. I left two saas of barley with my family and when we have finished that, Allah the Great and exalted is He - will provide. As for the two garments, I will take them for (my wife). Her dress is now in tatters and she is almost naked." Not long after that meeting with Saidina Umar ibn al-Khattab RA, Umayr ibn Sad al-Ansari RA passed away to his Lord. He was not weighted down with the cares and burdens of the world and he was concerned to provide plenty of provisions for the hereafter. Saidina Umar ibn al-Khattab RA received the news of his death with a heavy heart and said in deep sorrow: "I have wished to have men like Umayr ibn Sad al-Ansari RA whose help I could seek in dealing with the affairs of Muslims." Brief History of Umayr Ibn Sa'd during his governance of Hims or Homs in Syria. Jisr Manbij and its dependents, which he reduced on similar terms. 'Am al-Wardah or Ra's al-'Ain x to which he came next held out against him; so he left it. He then came to Tall Mauzin 2 and took it on the same terms as ar Ruha. That took place in the year 19. Against Karkisiya, Tyad directed Habib ibn-Maslamah-1-Fihri who took the city by a capitulation similar to that of ar-Rakkah. 'lyad captured Amid without fighting and on terms similar to those of ar-Ruha. He captured Maiyafarikin on the same terms. He also reduced the fort of Kafartutha. 3 After a conflict, he reduced Nasibin and the terms concluded were similar to those of ar-Ruha. Tur 'Abdin, 4 Hisn Maridin and Dara 5 he took on the same terms. Karda and Bazabda he conquered on the same terms as those of Nasibin. The patrician of az-Zawazan came to Tyacl and made terms re- garding his lands, agreeing to pay tax. All that took place in the year 19 and in a part of Muharram, year 20. He then advanced to Arzan and took possession of it on terms similar to those of Nasibin. He then passed through ad- Darb into Badlis which he left for Khilat with whose patri- cian he made terms. Finally, he got to al-'Ain al-Hamtdah in Armenia beyond which he did not go. On his way back, he made the chief of Badlis responsible for the kharaj of Khilat with its poll-tax and what was due on its patrician. He then proceeded to ar-Rakkah, and on to Hims whose governorship had been entrusted to him by 'Umar. In the year 20, he died. 'Umar after that appointed Sa'id ibn- 'Amir ibn-Hidhyam, who died after a short time. 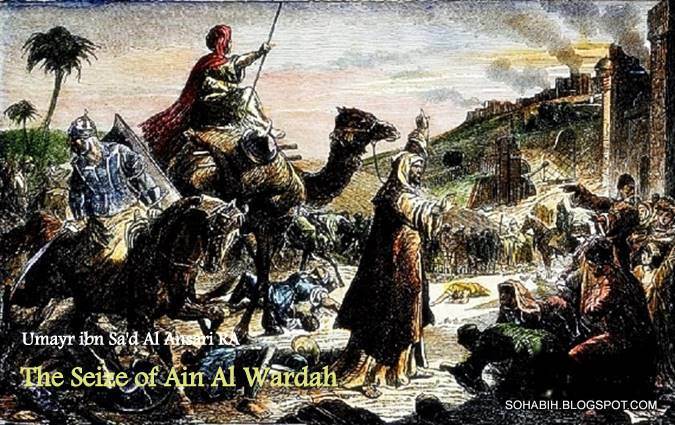 'Umar then appointed 'Umair ibn-Sa'd al-Ansari, who succeeded in capturing 'Am al-Wardah after a severe conflict. 'Ain al-Wardah or Ra's al-'Ain captured. Al-Wakidi from abu-Wahb al-Jaishani Dailam ibn-al-Muwassa' : 'Umar ibn-al-Khattab wrote to 'lyad instructing him to send 'Umair ibn-Sa'd to 'Ain al-Wardah. This he did. The van of the army went ahead, assailed a group of peasants and carried away some of the enemy's cattle as booty. The inhabitants of the city closed their gates and set up the mangonels x on them. Many Moslems were killed by stones and arrows. Then one of the patricians of the city appeared and cursed the Moslems saying, “We are different from what ye have met heretofore!" At last the city was taken by capitulation. Amr ibn-Muhammad from a grandfather of al-Hajjaj ibn-Abi-Mani’: Ra's al-'Ain 2 held out against 'lyad ibn- Ghanm; but 'Umair ibn-Sa'd, who was 'Umar's governor over Mesopotamia, reduced it after a fierce resistance on 177 the part of its inhabitants. The Moslems entered by force; but terms of capitulation were drawn up stipulating that the land be held by them and the tax be imposed on their persons to the amount of four dinars per head. Their women and children were not taken as captives. 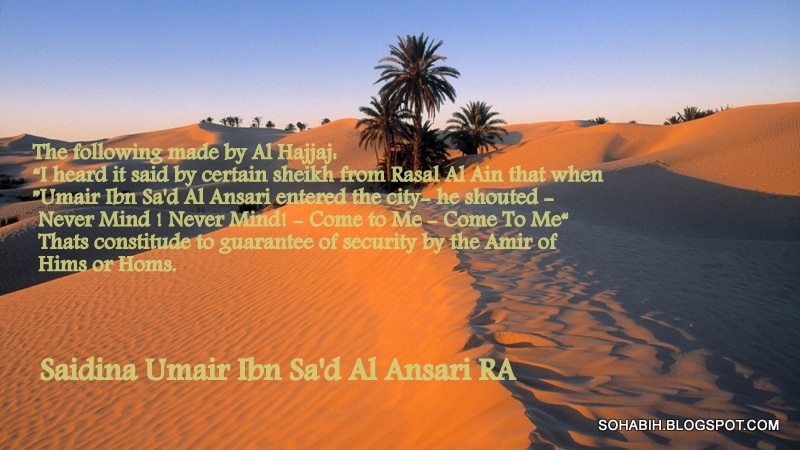 The following statement was made by al-Hajjaj: " I heard it said by certain sheikhs from Ra's al-'Ain that when 'Umair entered the city he shouted, 'Never mind; never mind; [come] to me! [come] to me!' and that constituted a guarantee of security for them." 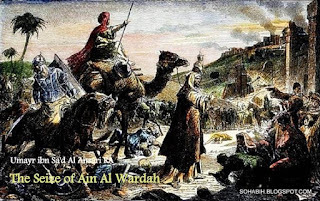 It is claimed by al-Haitham ibn-'Adi that 'Umar ibn-al- Khattab sent abu-Musa-1-Ash'ari to 'Ain al-Wardah, which 'Another name for 'Ain-al-Wardah. See al-Mas'wli, Tanbih Yakut.